Design Council Spark is a leading UK product innovation support programme and investment fund designed to help turn bright ideas into commercially successful products. 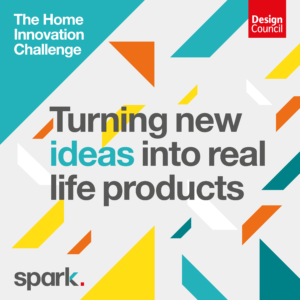 Now in its fifth year, Design Council Spark has a focus on driving home innovation, looking for product ideas that will make life at home easier and better for all. Here at Northern Housing Consortium and Consortium Procurement, we’re delighted to be supporting the Home Innovation Challenge. We’ve carried out a lot of research and engagement with members about the links between housing and health, and in particular housing and older people. Our work includes our research, the Hidden Costs of Poor Quality Housing in the North; roundtables exploring how the housing sector can work more closely with the health service; mental health; and roundtables and events exploring the impact of the digital switchover on housing schemes using technology enabled care. The home should be a joy to live in, yet for many it can be a chore. In the UK there are 14 million people living with a disability, and 25% of the population are due to be over the age of 65 by 2046. Design Council Spark showcases how innovative design is fundamental to futureproofing our ability to live independently and enabling bright ideas to transform the future home for everyone. Since its creation in 2014, Design Council Spark programme has helped more than 100 innovators and entrepreneurs to develop their product ideas, 45 of these have been intensively supported with mentoring, funding and specialist input to help them progress to market. Apply now with your bright idea.